A decorated model home off Lee Boulevard in Lehigh Acres, Florida has been donated for two weeks by Adams Homes to help feed the hungry, an idea that began at First Community Church. Dec. 6, 2011 - PRLog -- Christmas cheer has spread into even the floorboards of one building in Lehigh Acres. A model home off Lee Boulevard has been transformed into a holiday house to help feed the hungry. The holiday house idea began at First Community Congregational Church, where volunteer Barbara Snyder, 62, was seeing so many people coming into their food and bread pantry as well as their soup kitchen. It opened only a year before with about 100 people coming in for food. The day before Thanksgiving, she and about 60 volunteers served close to 300 people. For Snyder, the tipping point came when she saw a 3-year-old girl who came into the soup kitchen with her mother. The woman admitted that they had not eaten for two days and were living in their car. 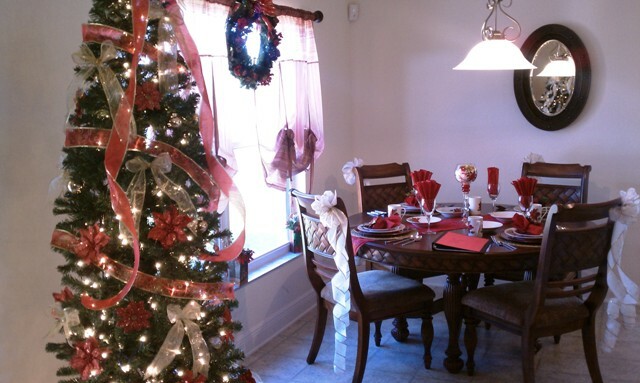 Adams Homes donated the house for the first two weeks of December. “I thought it was a wonderful thing to be a part of,” said Kristi Williams, community manager for Adams Homes in Lehigh Acres. Every room in the house will have crafts, decorations and ornaments made or purchased by members of the church. It will all be auctioned off with bids as low at $1 and as high as $290. All profits will go straight back into the ministry. On Friday, Snyder and two retired interior decorators rolled up their sleeves and began filling the home. Rooms are color-coordinated, with four trees completely decorated and for sale. There’s a theme for every room — the blue room is the master, and another room will be covered with poinsettias and another in white and gold. Interior decorating is the passion of Maria Powers, 46. A Lehigh Acres resident for six years, she was there when the church began the soup kitchen and was thrilled to use her talents to serve the community. The trick is to put the right amount of decorating into each room. Too much and it can feel cluttered, not enough and it can look sparse. Founded in 1991 by Wayne Adams, Adams Homes started serving homebuyers in Pensacola, Florida. Throughout the 1990's and early 2000's, Adams Homes grew its business into markets throughout Florida, Alabama, and Mississippi. Since 2005, Adams Homes has expanded into markets in North Carolina, South Carolina, Georgia, and Tennessee. Our headquarters is located in Gulf Breeze, Florida. We believe that a homebuilder should offer customers a purchase process that is easy to understand and a home that fits their needs. Adams Homes believes that value and satisfaction is delivered by offering a home with features that homebuyers want.